I'm having one of those weeks where I feel like I'm just barely hanging on. It's as if every time I accomplish one task, three more get added to the list. I suppose that's the nature of life with a toddler and a puppy, but at this point I'd like to feel like I'm at least a little bit above water. Part of the problem stems from the fact that I have high expectations for my mediocre cleaning abilities. I envision our house sparkling and organized after a week of tackling every room. The reality is this: between my less-than-perfect housekeeping skills and the toddler who is always following me leaving a trail of debris behind him, I'll always be playing catch-up. We are leaving for a long road trip on Saturday morning and to be completely honest, I can't wait to be able to sit still for just a little while. Even if Riley is screaming in the back seat and the dog insists on sitting on my lap. It's fine. As long as I don't have to move. Since I've already made this post somewhat of a rant, let's talk about Instagram. I rarely use Instagram photos on my blog because I'm not as talented with those photos as others. Let me just say this: when your black lab is chasing her tail because you've neglected to walk her and your toddler is running in circles around the dining room table yelling "Doggy! Doggy! ", you do what you have to do. The photo above is from Instagram. If you want to follow me and see pictures of my food, my dog and my child, click here. 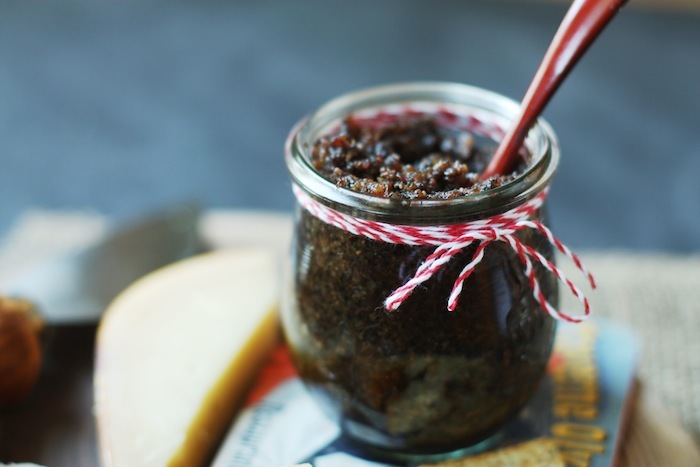 So let's talk about bacon jam. Because that seems like a completely normal segue after discussing life's stresses and photo apps. I made Maple Bourbon Bacon Jam and I don't feel at all bad about it. In fact, I'm quite proud of myself for taking this step into the world of bacon. Bacon and I have never been super close. We meet sometimes for breakfast on the weekends, but those occasions are few and far between. This jam business has taken me from having a casual relationship to having a serious/obsessed/stalker relationship with bacon. Peppered bacon, red onion, garlic, coffee, maple syrup, and bourbon make up this jam. It all blends together so wonderfully that you might start to question why these ingredients are ever apart. I've spread it on bread for grilled cheese sandwiches, served it alongside a cheese plate, and have considered trying it with this peanut butter toast. If you haven't tried bacon jam, I think this is the time. With all the summer parties and at-home happy hours going on this is a great item to have on hand. We had some friends over a couple weeks ago and I made mini grilled cheese toasts and served them with this jam. No kidding- we had appetizers ready in 5 minutes and gone in about 3. The jam is what did everyone in. It was a huge hit. So, regardless of what else happens this week, at least I have a jar of bacon jam in the refrigerator. Right? Line a large, rimmed baking sheet with aluminum foil and lay the bacon sliced on the sheet. If the bacon doesn't fit, use 2 baking sheets. Place in the oven and bake for 18-20 minutes or until the bacon is golden brown and crispy. Keep a close eye while it's baking- you don't want it to get over done. Let the bacon cool on the baking sheet for a couple of minutes. Remove the bacon and place it on a cutting board but DO NOT remove the foil. Carefully pour the bacon grease from the baking sheet into a large, heavy skillet (preferably cast iron if you have it). You should have about 2 tablespoons of bacon grease. Heat it over medium heat, then add the onions and garlic. Cook until the onions are soft and translucent. While the onion cooks, cut the bacon into 1/2 inch pieces. Add the bacon to the pan and toss it all to combine. Cook for about 3 minutes. Add the maple syrup and coffee grounds to the pan and cook for another 5 minutes. If it seems like the bacon mixture is too dry (there should be a bit of liquid at all times), add a couple tablespoons of water to the pan. Reduce the heat to low and simmer for 15 minutes, stirring occasionally. Add the Bourbon and cook for another 20 minutes, adding water as needed. Transfer the bacon mixture to a food processor and pulse a few times. The jam should not be completely smooth, but should have some texture. 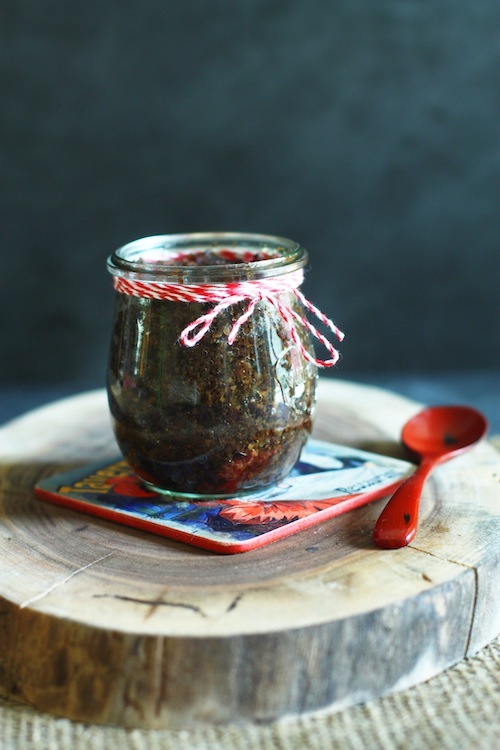 Transfer the bacon jam from the food processor to a jar and cover with the lid. Cool completely before putting it in the refrigerator. The jam will keep for 2 weeks.